Created for the Giant Bomb based game-jam, Giant ROM 4. Named for the tumblr properly petting puppies run by the one who gave the 'One Big Chomp' theme for the jam. PPP was made with GameMaker: Studio in 9 days, and is the first game project considered as actually completed in my mind. A level select screen presents 3 stages, but they must be completed to unlock the next. Your top pet score for that stage is saved and displayed outside. The level select being "in-game" allows for testing out the controls, including humans to be pet by, to avoid crafting a level just for a tutorial. This good picture of one Matt Rorie will chase you across the level. He will stop if he notices a soda machine that is running too hot - but not forever! Break a soda machines cooling by peeing on their plug. Pee builds up over time but for a large increase, drink a bowl of water. Getting to the end of each stage is not just a walk through the park! 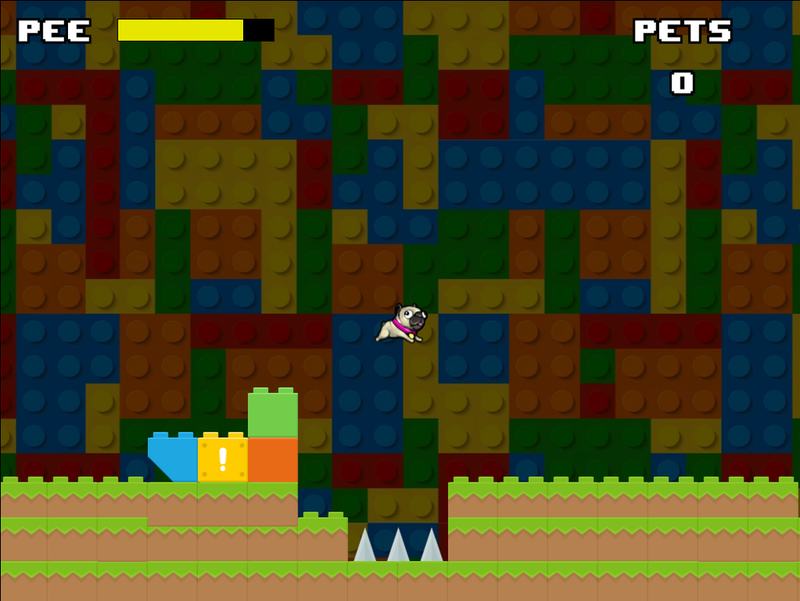 Do jumps, avoid obstacles, keep your pace ahead of Rorie, all while trying to find people to pet you!